Please click on any book cover below to get more details about the book. They are full of helpful information. They are offered at no cost to Kentucky residents and will be mailed to you free. 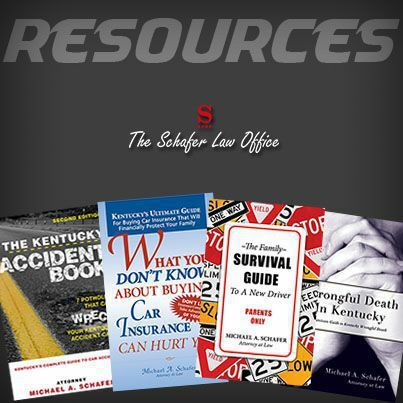 These books and resources are a great way to get the knowledge and assistance you need when you have been injured through no fault of your own in Kentucky. Learn how to survive a brand new teenage driver, educate yourself on what car insurance companies are doing during your case and much more! Did you know there are some Kentucky laws that could hurt your case if you're injured in an auto accident? Be aware of all the different elements of a personal injury case so you know exactly what to do if you're injured. You have questions and problems to solve. The Schafer Law Office has the resources to help you. All of these resources are FREE and available for you anytime upon request. This book provides information everyone in Kentucky should know. That is how to buy car insurance that will protect their family should there be a tragic car accident. You will find the necessary information about coverages available when buying insurance. You will also find out what different coverages are available and important questions to ask your insurance agent when buying car insurance. 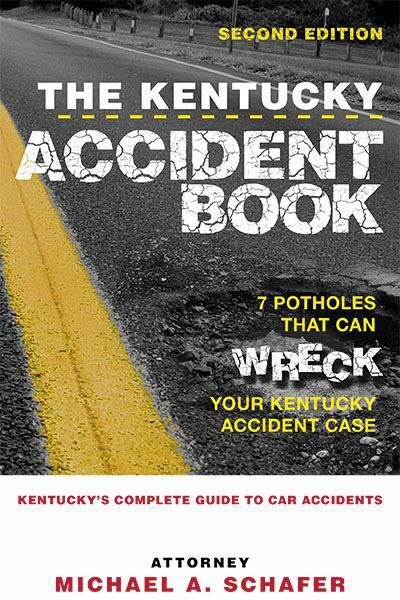 This book aids consumers and accident victims in Kentucky. 7 Potholes That Can Wreck Your Kentucky Accident Case outlines common mistakes people make after they have been in an accident. This book will explain how to avoid them and arm accident victims with the information necessary to place them on a level playing field against the insurance industry. The Schafer Law Office hopes the consumer will be able to use this information to help them receive a fair and just resolution to their accident case. Many people are surprised to learn that Kentucky law only allows certain family members to recover for the wrongful death of a loved one. "Wrongful Death In Kentucky" explains Kentucky law covering everything from planning a funeral to setting up an estate. It's a big resource to the family. Teaching your children to drive is an exciting time, but it can also be hard at times. In this book, Mike Schafer, along with his daughters, Rachael and Savannah, team up to give perspectives of learning to drive from both the parent's and the teen's point of view. Everything is covered from their permit to getting their license. This is a must read for any family with a new driver. Being in an auto accident is never a fun thing. However, if you're prepared, and you know how to handle the situation, it makes the situation much easier to handle. This accident guide is meant to be in your car to give you an excellent resource to help you in case you're in an accident. d'Oliveira and Associates are personal injury attorneys in Rhode Island with 15 offices. Charles Boyk is an attorney out of Toledo, Ohio and practices in personal injury cases. Kenny Christensen is out of Salt Lake City, Utah and is an attorney practicing personal injury cases. Charlie Hofheimer is an attorney from Virginia Beach, Virginia and handles divorce and child custody cases while only representing women. Chris Davis is an attorney out of Seattle, Washington who practices in several areas including personal injury cases. Larry Buckfire is an attorney out of Detroit, Michigan who handles personal injury cases. Tom Kiley is a personal injury attorney in Boston, Massachusetts. Bisnar and Chase are personal injury attorneys from California. Nancy Cavey is an attorney from Florida who handles cases involving Social Security Benefits. The American Lawyer Academy is an organization dedicated to promoting excellence in the legal profession throughout North America.